IN THE wet tropics, south of Cairns, the romantic ruins of one man's dream hides in the rainforest at the edge of Mena Creek Falls. Carpets of moss conceal the whimsical castle as the landscape tries to reclaim the grounds of the now award-winning tourism attraction in Queensland's north. Paronella Park, once the vision of a Catalonian cane-cutter, Jose Paronella, emerged from the virgin forest in 1929. 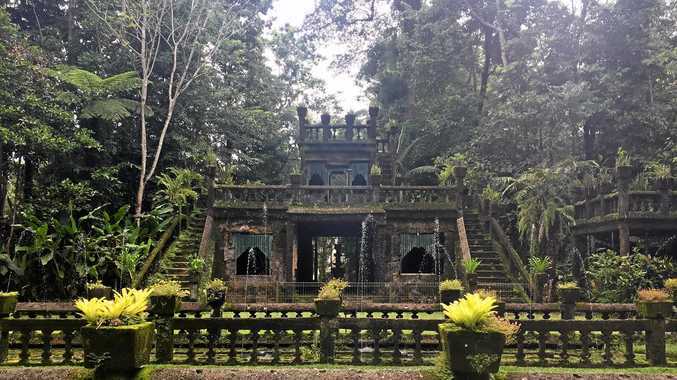 The Spaniard spent 11 years in Australia working the cane fields when he purchased the five-hectare allotment to build a castle by hand for his new wife. It's hard to imagine how such intricately adorned buildings were crafted by hand and human might in such tropical conditions. In addition to a cottage, stands the remains of a movie theatre and ball room where mirror balls once spun, a grand 47-step outdoor staircase, a turret-topped pavilion and now grass-covered tennis courts once built from crushed termite mounds. Paronella planted some 7000 trees including a cathedral-like avenue of kauri trees. He was also responsible for building North Queensland's first hydroelectric plant in 1933 to power the castle. The turbine was restored in 2009 and continues to power the park. 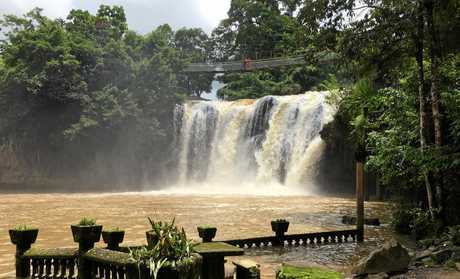 Paronella opened the castle to the public in 1935 and it soon became the social scene for couples to enjoy movies and ball dances, row beneath the waterfall or enjoy a picnic at the foot of the falls. Remnants of the beautifully crafted picnic tables and bench seats still remain, sometimes temporarily hidden beneath the water during the wet season. Jose died in 1948 and his wife Margarita in 1967. Their son Joe and his wife Val, and later their children, became custodians of the park until it was sold in 1977. A fire almost destroyed the castle in 1979, closing the park temporarily. Cyclone Winifred, Larry and Yasi also tested the buildings' endurance more recently. The lasting remnants are a spectacular reminder of Paronella's dream, something it's new owners, Judy and Mark Evans, have worked tirelessly to preserve since they bought the heritage-listed property in 1993. Today, visitors can wander through the ruins, bring a picnic and delight in the park's glory. At night, luminescent mushrooms glow in the dark and during breeding season fireflies illuminate the park like fairy lights. Even the fingerprints of Paronella and his workers are still visible in the cement foundations, adding to the magic.